If I told you that this pie tastes exactly like the first cube of grape-flavored bubblegum you unfolded from waxy paper and stuffed in your grade school-sized mouth, barely able to contain its spill of citric acid and high fructose corn syrup “juices,” would that go against every fresh, seasonal, farm-to-table objective that this blog (and this pie) strives to attain? Probably. But it sort of does. And when baked with an open-design top crust, it’s bubblicious, too. The ironic secret to this is fresh, upstate New York concord grapes, now in season. Eaten fresh, these grapes have a more crisp, grassy bite. But when cooked with sugar and a bit of apples to round out the flavor, they’re unmistakably distinct, grapity-grape sweet. 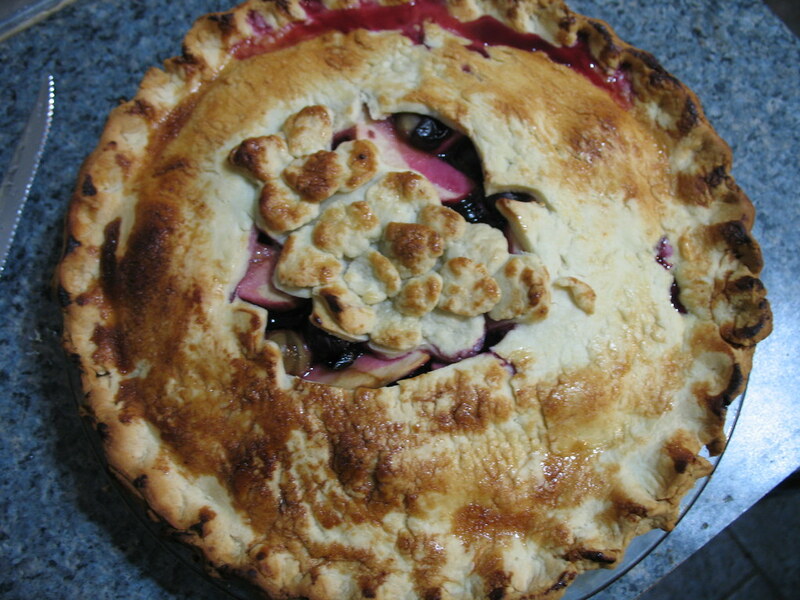 This was my first time baking concord grapes in a pie, and the apples came into play as a mistake. I just didn’t have enough grapes — I’d bought them on a whim, not knowing exactly what I’d make of them — to fill a 9-inch pie. 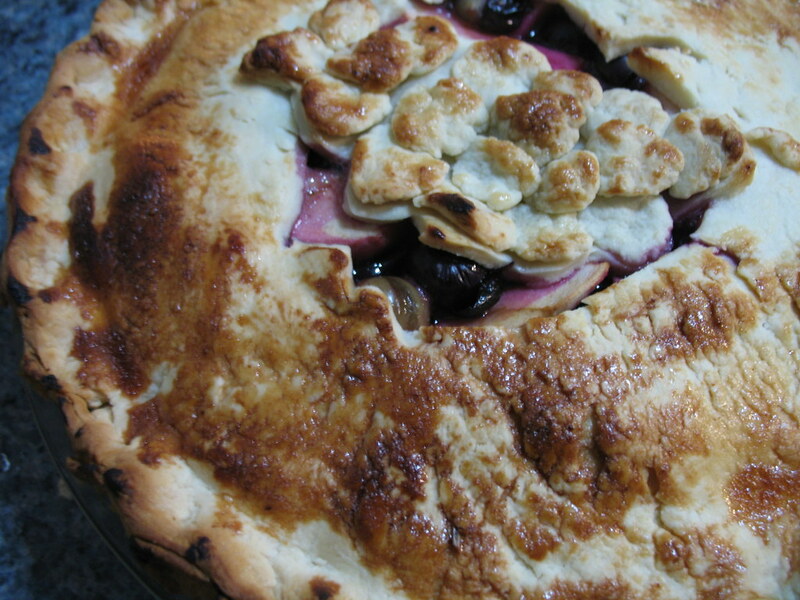 So, with a nod to the Welch juice flavors of yesteryear, I devised this grape-apple pie. Grapple pie? Grapity-apple double trouble yum bubbly bubble pie? I give up; it is what it is. I was on a high of pie baking as of late, after my third-place finish at Enid’s apple pie contest. So when desserts were requested for a backyard pig roast I attended last week, I was immediately pinned for the pies. If you haven’t noticed this, I hate to make the same pie twice; nor the same ice cream flavor (unless it’s vanilla); nor the same chili, or pizza. (This could go on for a while.) Good thing I can still find some recipe-inspiring ingredient at the Greenmarket whenever I take my Saturday stroll through. This time it was the concord grapes. From the outcome of this pie, it looks like I could get better acquainted with them still. 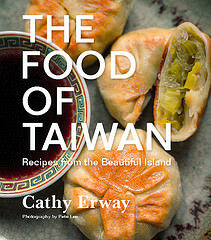 While they tasted delicious, and cooked to a beautiful, deep red-purple, I didn’t bother to seed the individual grapes. Therefore, everyone got a little crunch of seed with every bite. Now, I hardly mind this myself, but I sense it’s not the optimum pie-eating experience. If anyone has any suggestions on how best to remove those tiny little seeds beforehand — I’m guessing you just get in there with a paring knife and squish each little bugger pretty well in the process — please fire away. In the meantime, here’s my recipe for a grapeskin and seed-included, minimally sweetened, au naturel grape and apple pie. 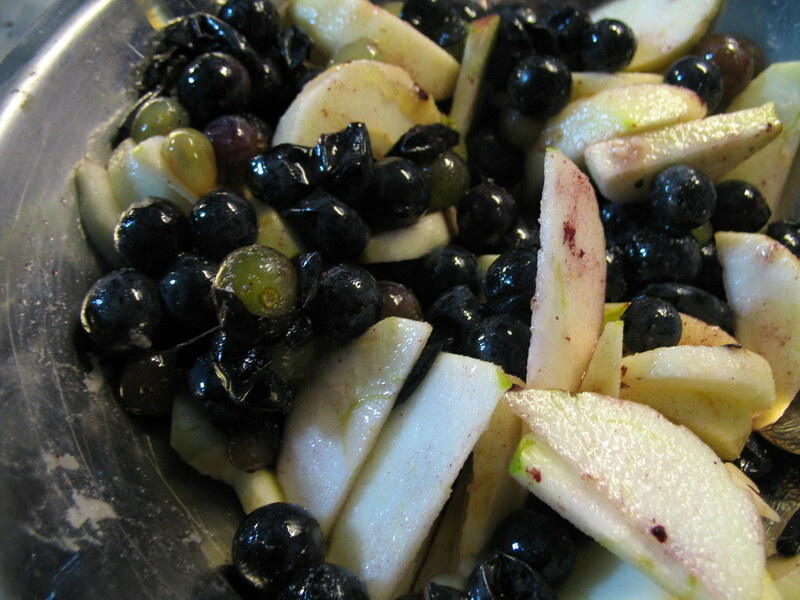 In a large bowl, combine the grapes and sliced apples with the sugar, lemon juice and optional nutmeg. Roll one pastry ball out and transfer to the bottom of a 9-inch pie pan. Fill with the fruit. 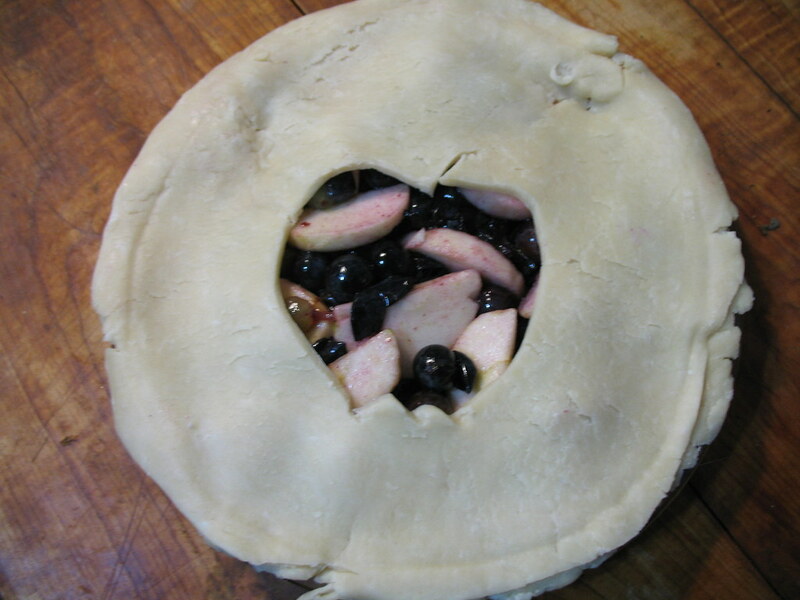 Roll out top crust and, if desired, cut out (apple and grape-shaped!) designs. Crimp edges. (Optional: Brush top of pie with egg wash, milk or cream and/or sprinkle it with sugar. Bake at 375 degrees for about 40 minutes, or until lightly browned on top. Six brownie points: Probably the least affixed I’ve ever affixed to a pie. This one’s surprisingly healthy tally owes to its barely seasoned apple and grape filling. The minimal use of sugar seems to work as these concord grapes are kind of a powerhouse of flavor. Plus, they’re packed with antioxidants, especially with the skins left on. 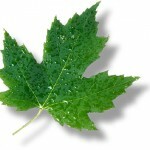 Seven maple leave: What’s not green about a pie with local, seasonal fruit? Okay, a spurt of lemon, some sugar perhaps, but its whole raison d’etre was seasonality. Gosh, I’m going to miss grapes once they’re out. This is absolutely beautiful. As a lover of grape gum, I would like to have a piece of this for breakfast. Grape season here is so short! It’s a bit heartbreaking – I love them too. I love the flavor of concord grapes. They actually taste like grapes (unlike the mass supermarket variety). But I bet those seeds would be a little annoying in pie form. A very inspired post. Just brilliant to add apples! I’ve made concord grape pie a few times (sans seeds) and it’s my favorite pie, no doubt about that. Apples are in my next one. the vendor at grand army near the eastern parkway side sells seedless concords (by the pound)! This is certainly a nice twist on the same apple pies I usually bake during the fall. It is nice to see you holding back on the sugar so you can actually taste the fruit flavors. I just made a version of Concord Grape Pie last week and the recipe I used has you squeeze the grapes out of their skins (easy to do) and then you boil the insides. You then strain the insides through a mesh strainer, mix the skins back in, sugar, etc and then bake the filling like that. Worked like a charm for me. I agree with erin’s post above. I’ve made a concord grape pie in the past by squeezing out the insides, cooking them, pushing through a mess strainer, and then adding the skins back in. Slightly time consuming, but very easy and worth it! I’m going to try your recipe using the same technique. The metal strainer is a foley. You use that to get te seeds out. Leslie tells you how to do it. Seedless grapes won’t work as well – not as flavorful. I once lost a Martha Stewart-judged pie contest to a woman who baked a Concord grape pie and used duck fat for the crust. Afterwards we all tucked into each other’s pies and the grape one was the clear winner. As a regular hiker, I’ve watched the wild grapes ripen in Harriman State Park all year, and finally they’re ready. There are so many different kinds — not just the little fox grapes, but Concords, and antique remnants of old, long-gone farms. There’s a grape near Sebago Beach that’s HUGE! (http://www.myharriman.com/giant-wild-grapes-near-lake-sebago-beach/) I look forward to gathering them there this year, and trying this recipe. Kudos for your 2-year experiment!